Watts Pest Prevention is the best Weed, Bird, Pest, Termite and Scorpion control company serving Phoenix, Scottsdale, Chandler, Mesa, Gilbert AZ plus all the greater Arizona cities. Our Pest control services include residential and commercial. Arizona’s premier Pest Control company offering quality, dependable, environmentally responsible methods to prevent Pests. We provide service solutions for ants, bed bugs, black widows, carpenter ants, gophers, cockroaches, and rodents. We also provide services for spider control. When a Bug Guy just isn't good enough, it's time to call Watts Pest Prevention. jahmaine - field tech . from marc watts - owner ! i recommend using watts pest & weed control ! Watts is the BEST! I’ve never met people so nice and so accommodating. Would highly recommend them. I won’t be using anyone else for pest prevention/service! Thank you all so much! So pleased to be rid of the cockroaches in my kitchen! My previous pest company tried for a few months and nothing... these guys came out once and I haven’t seen a single big since!!! Thank you thank you! Very reasonably priced as well! Highly highly recommend them!! Your company is doing a great job protecting me from pesky pests! I have enjoyed the professionalism and flexibility of the service tech and customer service personnel. The service is always excellent and the owner is commit to meeting the customer’s expectations. Perfect...perfect...very good job every month. Always on time service ! Very happy my son recommended Watts to me ! Thank you ! Good work and responsive customer service. Watts is always on time and always does a great job. We had an issue once and they returned and took care of it immediately. They are the best!!! Very competent service, on time and discussed guarantees. Thanks. I have had excellent service with Watts. The only thing I would like to change would be the weed service. The spray is getting too close to shrubs and killing the lower edges. Thx. Watts delivered on their promise. Our troublesome critter was removed humanely. Prompt. Responsive. Reasonable. Reliable. Trustworthy. Fantastic service! Super friendly and efficient service! Will certainly use again and would highly recommend! Our technician, Marc Jr is very professional and always has a smile. Great service, courteous technicians and great prices! Great Service! Great staff with friendly customer service. My place has been clean of bugs for a while now thanks to this great company! And great prices. Thank you watts! Excellent professional service. Quick response and thorough in every respect. Would be the first ones to call if needed again. Quick friendly service that addressed my problem without trying to sell me something more than what I needed!! That is hard to find these days. Jahmaine was quick to assess what the problem was and the access points, we discussed the best solution and he addressed it immediately which in turn made for a quick resolution to the problem. Thank you Watt’s pest prevention for all your help! Always a good job. I appreciate the effort to make things right again. Watts has the most conscientious service system I have experienced, with flawless pest control and delightful mannerly servicemen. A+ all the way, depend on it! Quality work. Fair pricing. Was able to get work done quickly. “Pigeon issue”. We have been using Watts for almost 8 years. They do a great job every time and their staff are always courteous. They also always try to accomodate our schedules. Highly recommended company. I have had the pleasure of using Watts pest control for many years and they have always taken care of the Arizona ‘critters’ that I want eliminated when necessary. The staff is courteous and thorough and they always have rescheduled my appointments when that need arose for me. They do always excellent job, all the members of the company are professional, polite and hard workers. Watts is always professional and courteous. I have always been happy with my service results as well as the technicians. The office staff is also great! 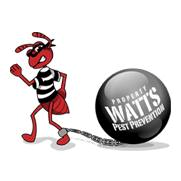 Watts has been my pest prevention provider for the last 2 years and I have been nothing but happy with their service! The technicians that come out are incredibly nice and knowledgeable with great attention to detail. Would never consider change. Good job and reasonable cost. Watts pest are honest and thorough. They have been taking care of our pest problems and we are satisfied with their services. I love these guys. They go above and beyond to make sure you’re satisfied. I like the fact that they are a family run business where you get that “personal “ touch. Absolutely wonderful service! Very professional, thorough, and courteous. I highly recommend this company for anyone with a pest problem!! !